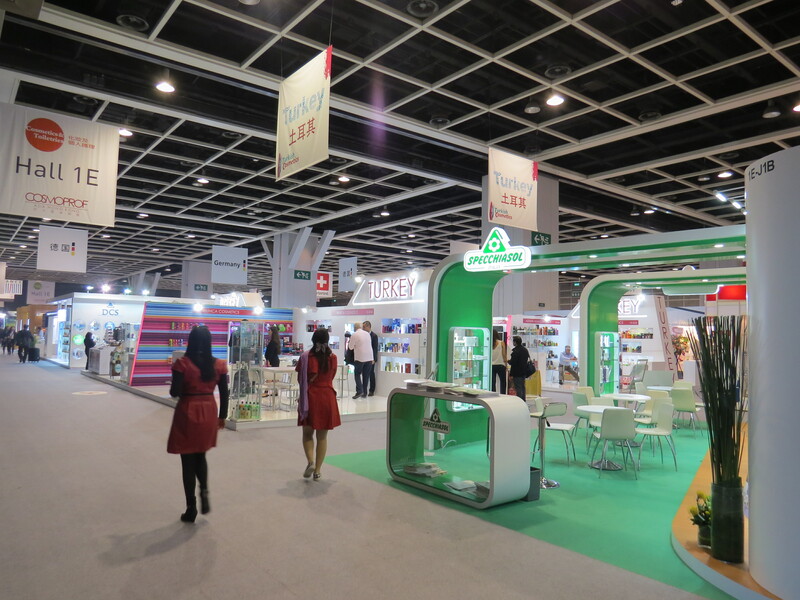 ← Retail notes from Taipei: [Company Profile] Eslite! The location of the exhibition center was great – right next to the waterfront – but in terms of architecture it wasn’t quite as impressive as the Big Sight exhibition center in Tokyo (which is where CosmeTokyo 2014 took place). Perhaps this was because like almost all skyscrapers in Hong Kong, the building was much too tall to observe from the outside. 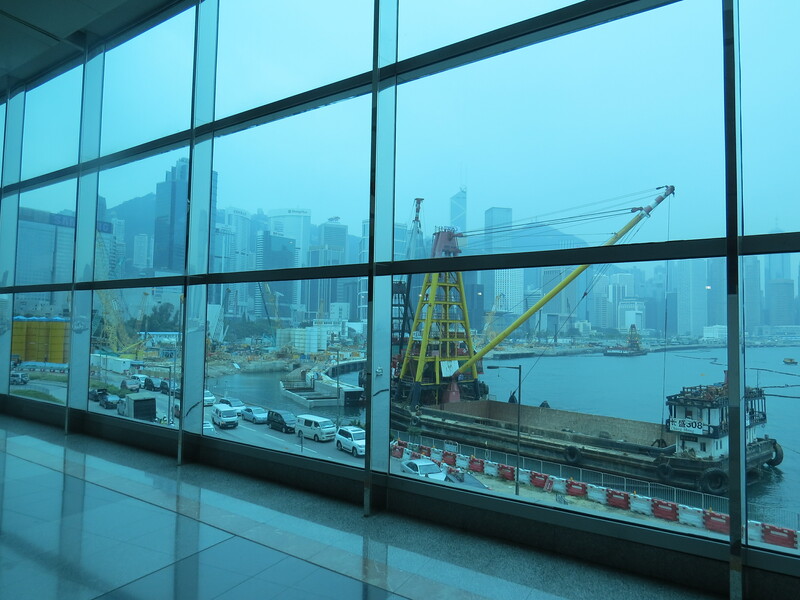 Also, like most buildings in Hong Kong the exhibition center is so interconnected with the MTR station and the other surrounding office towers and shopping malls, that it is difficult to perceive it as a free-standing entity. Basically it’s all one sprawling building complex. Anyway! 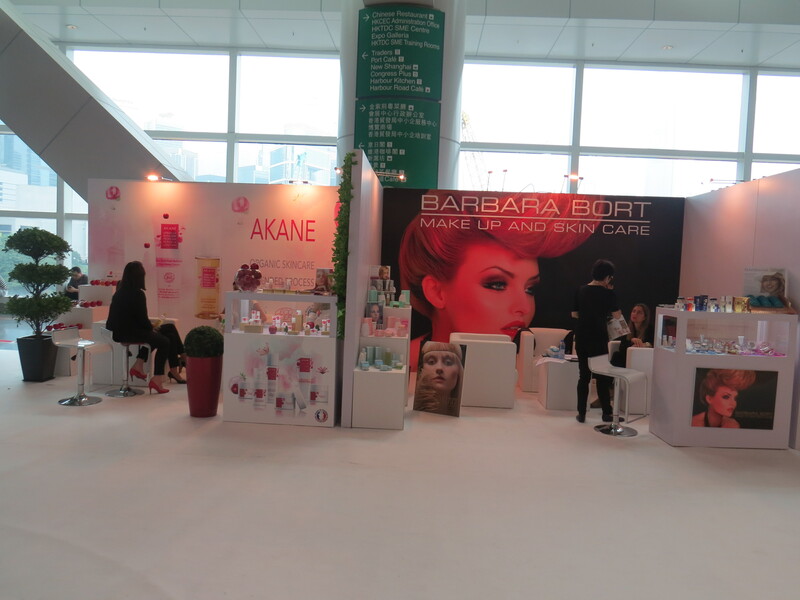 The show was divided into six sections: Cosmetics & Toiletries (“normal” retail cosmetics), Natural Health (supplements, health drinks and functional foods), Pack & OEM (packaging and ingredients/OEM manufacturing), Hair Salon (salon/professional hair care and equipment), Beauty Salon (salon skin and body care and equipment) and Nails & Accessories (self-explanatory!). 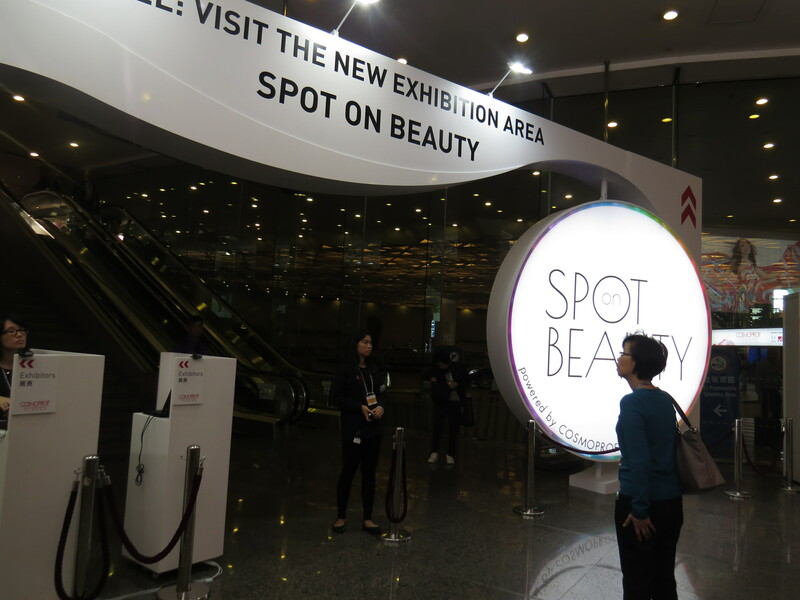 There were also two new sections at the show this year: Spot on Beauty (an exhibition area for beauty products from primarily Asian exhibitors) and Prestige Avenue (ten niche companies from different countries). 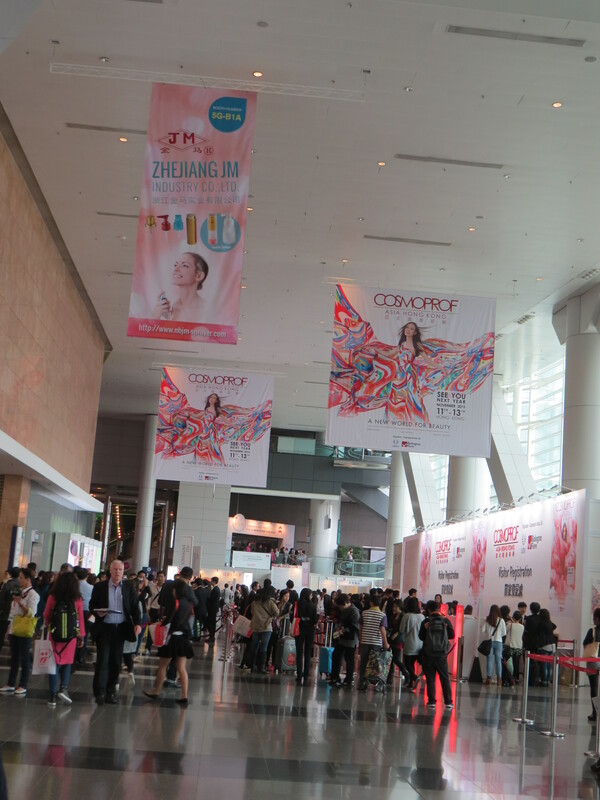 According to the official trade show statistics, a total of 2,362 exhibitors from 22 countries were at Cosmoprof Asia. 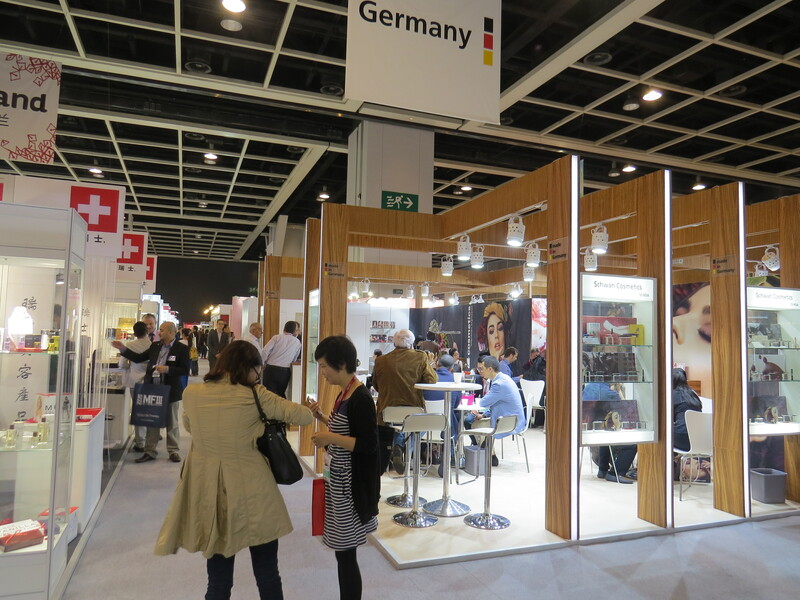 Unsurprisingly China was the biggest exhibitor country (seriously, in terms of numbers they dwarfed everyone else!). 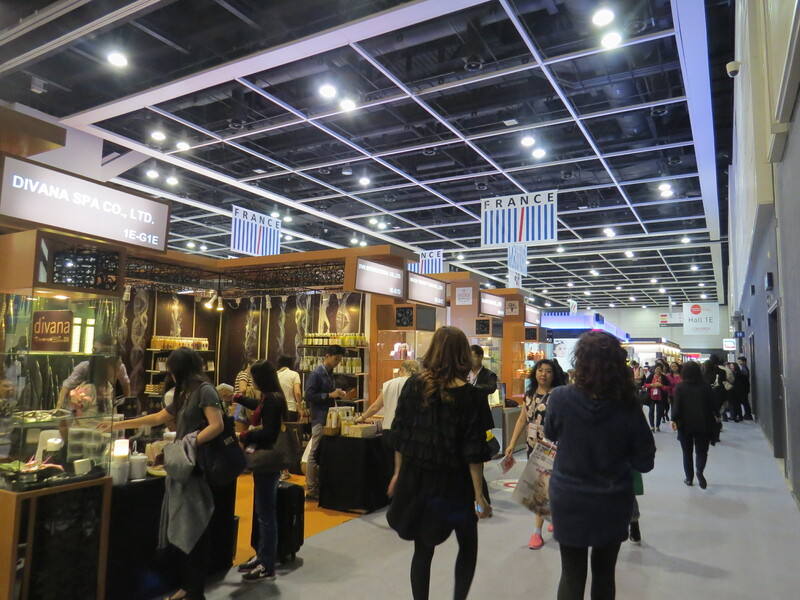 However, almost all of the Chinese companies were exhibiting in the Pack & OEM and Nail & Accessories sections; very few retail or salon brands at the show were actually from China. 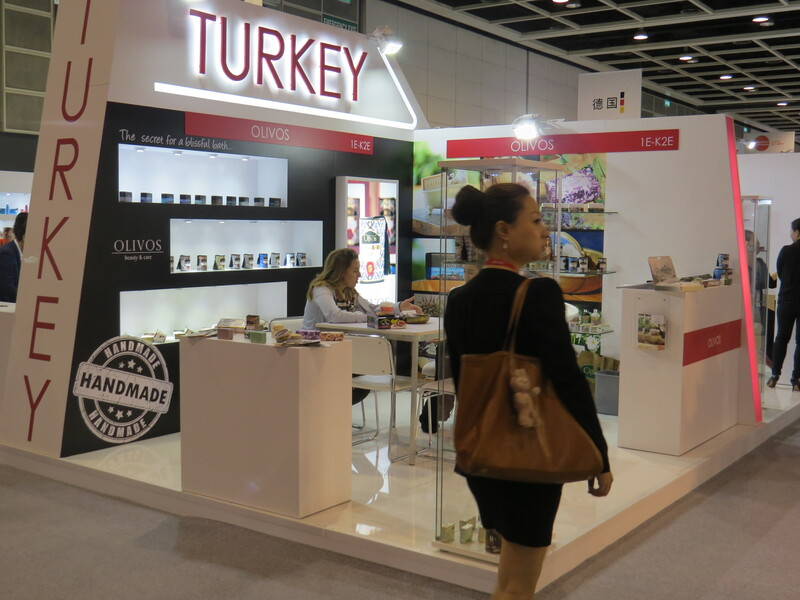 After China, Hong Kong and Korea were the largest exhibitor countries. Korean cosmetics brands are already very respected in the Asian region, but at the moment K-Beauty is seeing a big surge in popularity: especially in Hong Kong but also in Japan and other East Asian countries. Over the last five years or so, many Korean brands have opened retail boutiques in Hong Kong. And a Watson’s store I visited this evening even had a separate K-Beauty Academy shelf area which featured a whole range of Korean brands, including Holika Holika and Tony Moly. 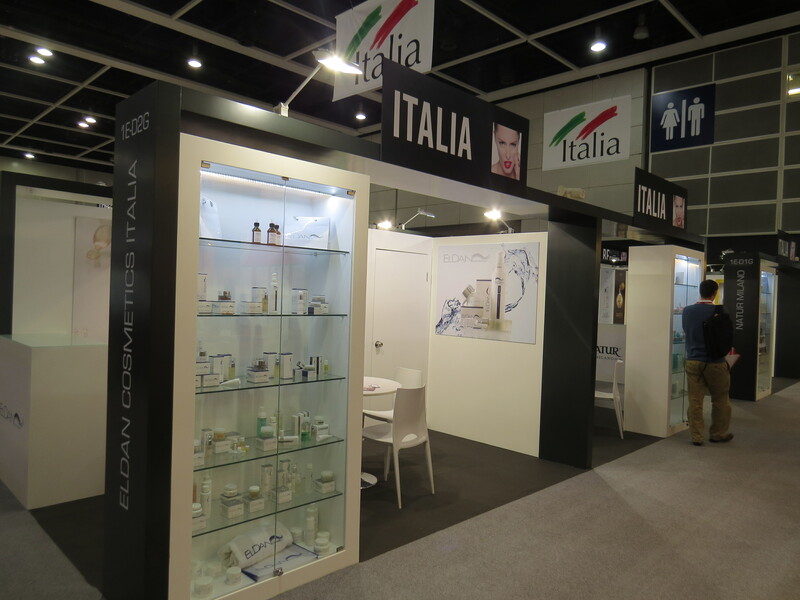 After China, Hong Kong and Korea, the biggest exhibitor countries were Japan and Taiwan; both of these had a similar number of companies at the show. Looking at the Western exhibitors, France was the largest country followed by Spain, Italy, Germany, Poland and the UK, in that order. The US and Australia were also represented with a significant number of companies. As you can imagine the three days of the show were very busy. 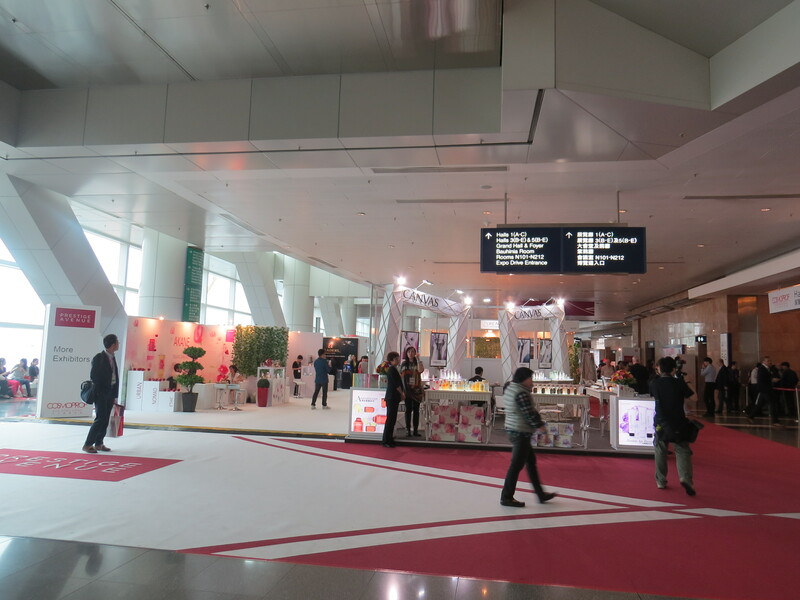 I concentrated on the exhibitors in Hall 1 (Cosmetics & Toiletries) but also managed to check out the other floors, albeit very briefly. There were many new brands to discover but I was also delighted to see some old favourites. 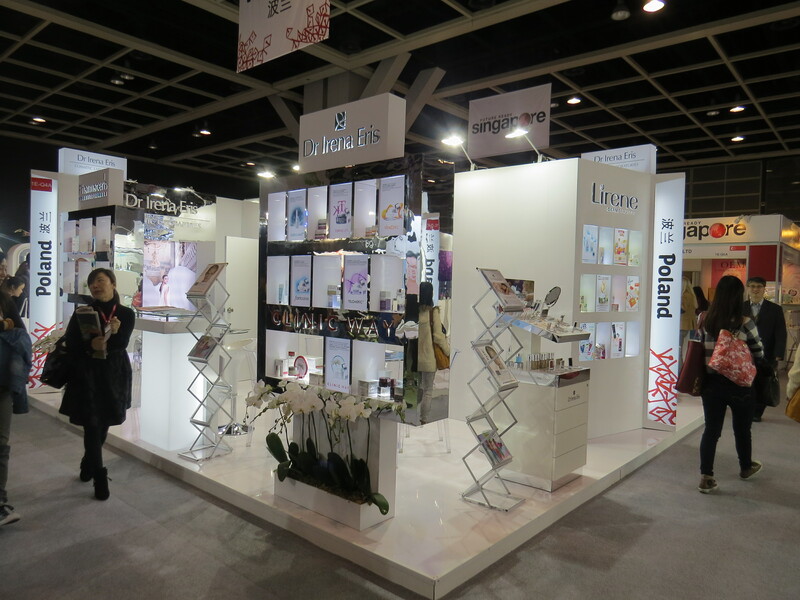 For example, one of the exhibitors at Cosmoprof was InEarth, a company from Hokkaido in Japan. I had seen InEarth at CosmeTokyo; they have a charming organic face care range, Lavender+. 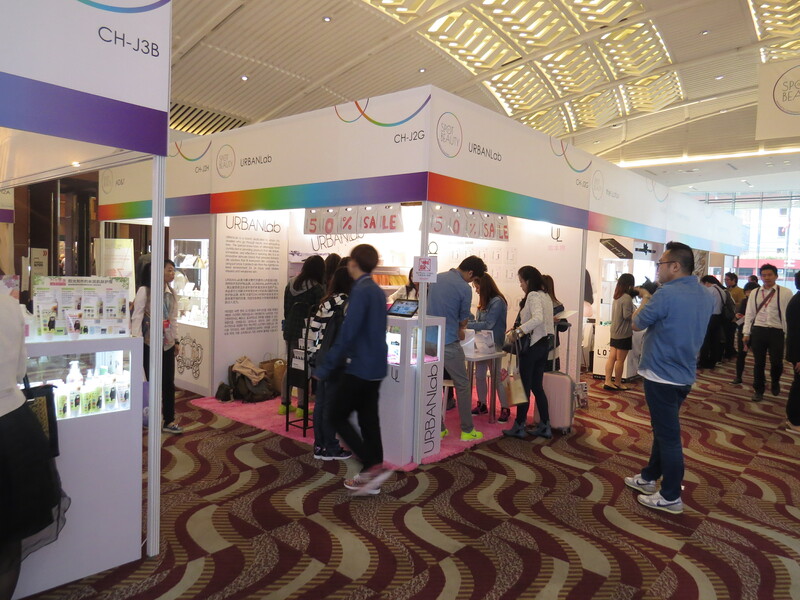 Glourish Korean Skin Care Products were also at the show. 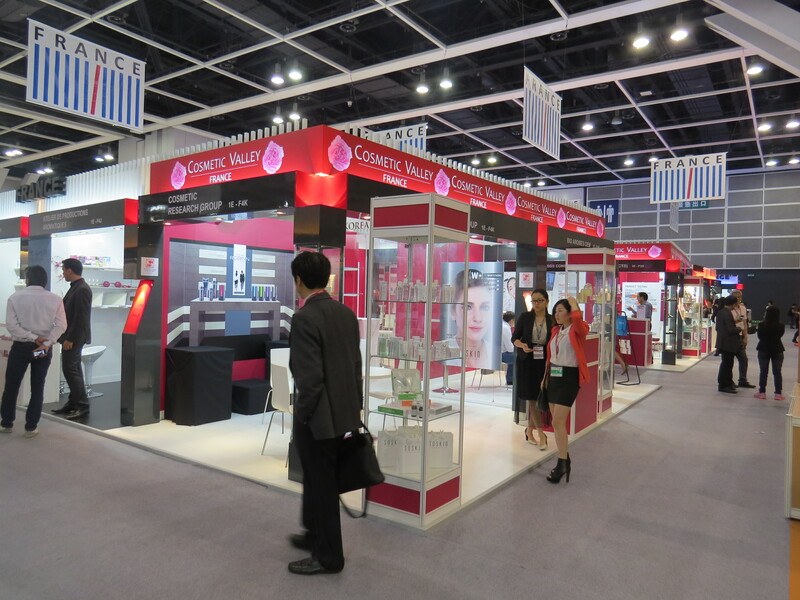 They are the official Hong Kong distributors of Skin Watchers, a Korean brand which I discovered in Singapore last year. Skin Watchers has a snail range (the products are formulated with snail slime!) which is great; I bought the snail toner and really like the product. Besides the Green Snail product range which includes six sku, Skin Watchers’ portfolio also features the four-sku AC Clearing range for problem skin and various other stand-alone product lines. 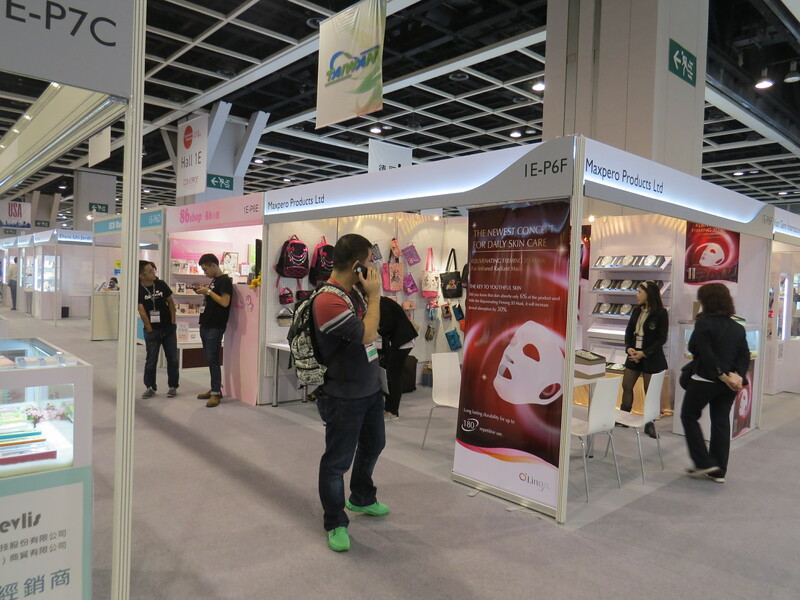 Tenart Biotech from Taiwan was also at the show to present their MasKingdom face mask brand. 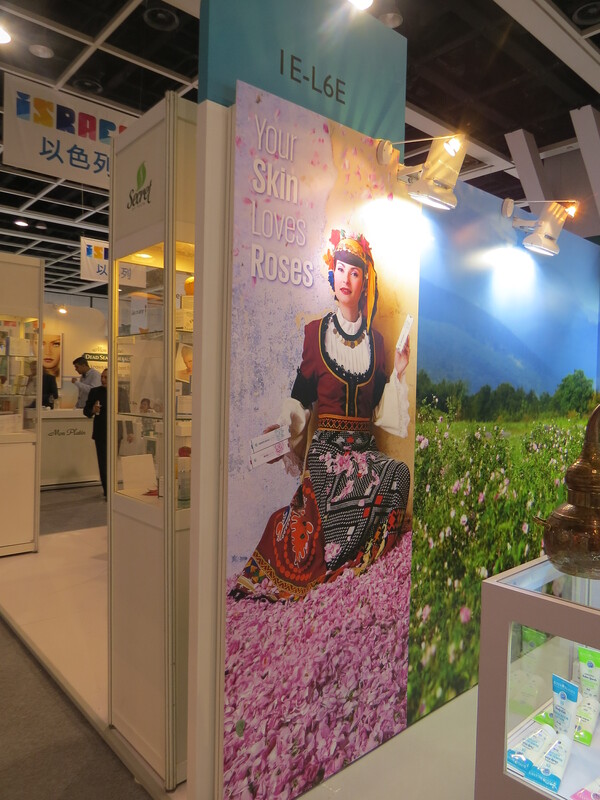 I had visited the MasKingdom flagship store while I was in Taipei and liked it very much, so it was great to see them at Cosmoprof Asia. Check out my article on MasKingdom here. Amongst the Polish exhibitors were several brands I had met during my trip to Warsaw in September. Alba 1913, for example, was also at the show and Lukasz Rychlicki, the company’s CEO, told me that in December/January 2015 the brand will be launched in Vietnam, Hong Kong and Taiwan. Well done, Alba! Organic brand Phenomé (Biogened) was also at the show. The company’s product portfolio includes some 100 beautifully packaged skus. 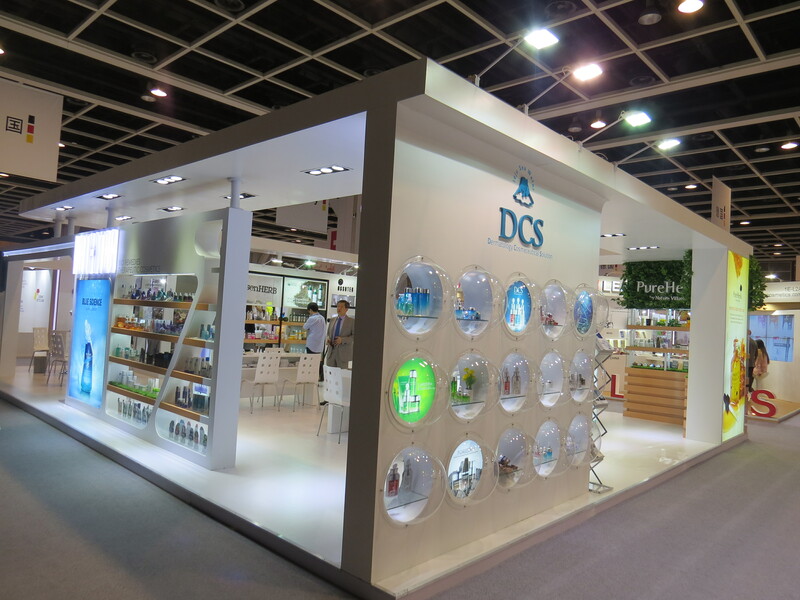 They were at Cosmoprof Asia for the third time and at the show they presented their new brightening range which was launched in October. Alteya Organics from Bulgaria I knew from various European trade shows. The company specializes in products made with rose extract and rose water harvested in Bulgaria (for my international readers: Bulgarian rose oil is famous and quite expensive). 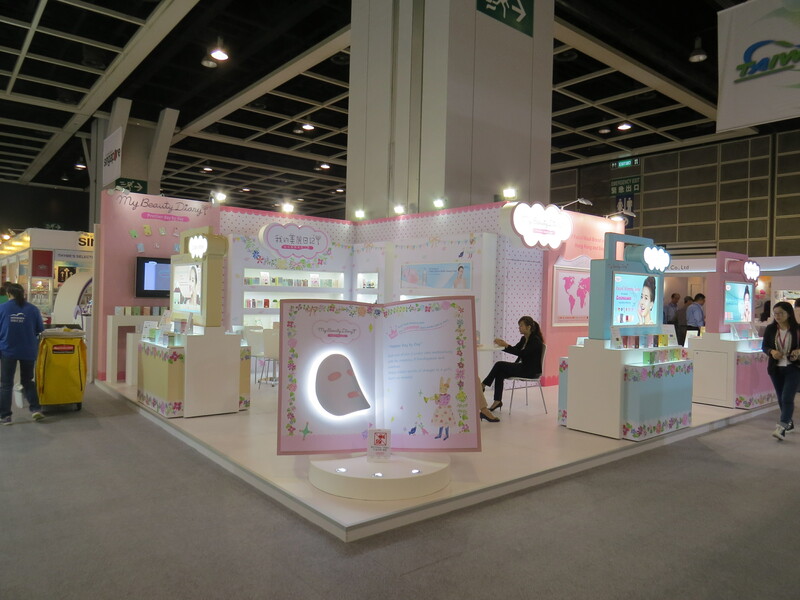 At Cosmoprof Asia, Alteya presented its range of organic (USDA certified) range of flower waters as well as a new and very nicely packaged baby care range. The baby range includes baby balms and diaper creams, a gentle hair and body wash, a light body lotion, a rose water splash and a calming mist. 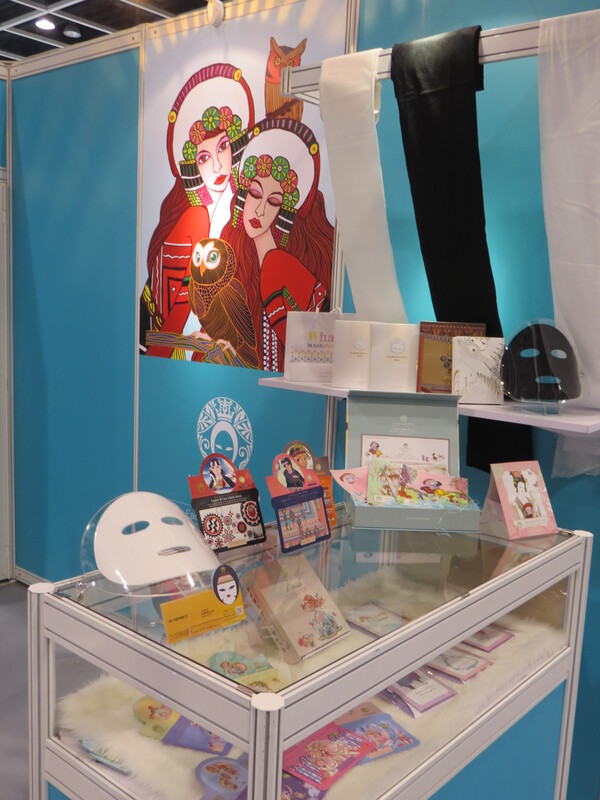 Another exhibitor from Taiwan was 86shop. Now, this company I find particularly interesting so I was delighted to have a chance to chat with one of 86shop’s sales specialists. I had seen the 86shops in Taipei and knew that they had a similar concept to @cosme (a Japanese beauty retailer who very successfully merges online and offline retail, see my article on @cosme here). Like @cosme, 86shop (which was founded in 2006) started out as a beauty online store. Then they opened bricks & mortar outlets; I visited several of these in Taipei (you can always tell an 86shop by the large groups of excited female beauty shoppers outside). 68shop sells some Western brands but the main focus is on Asian beauty with a slant towards teenage and lifestyle brands – they know their demographic! The product line-up changes once a month or so and the brand selection is obviously very trend-driven. 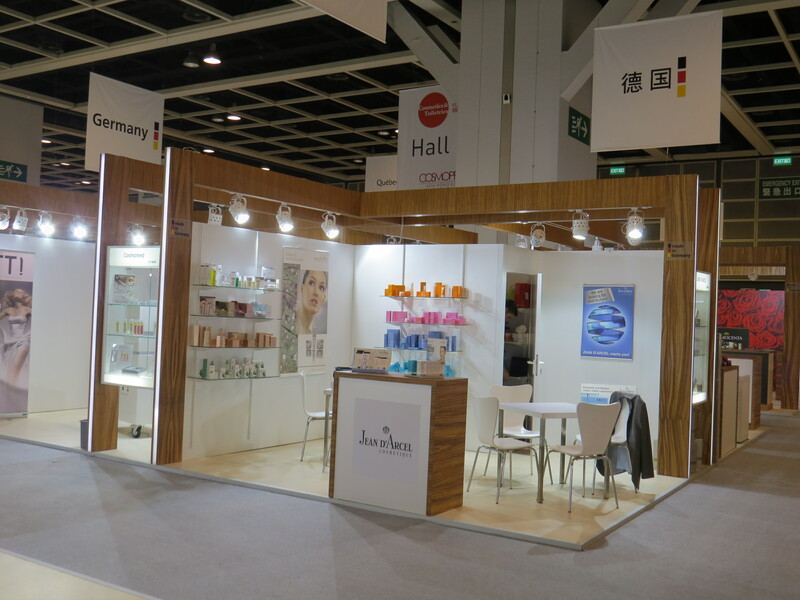 However, 86shop also has an own label range which they presented at their stand at Cosmoprof: Miss Hana and Hanaka includes skin and body care as well as colour cosmetics. 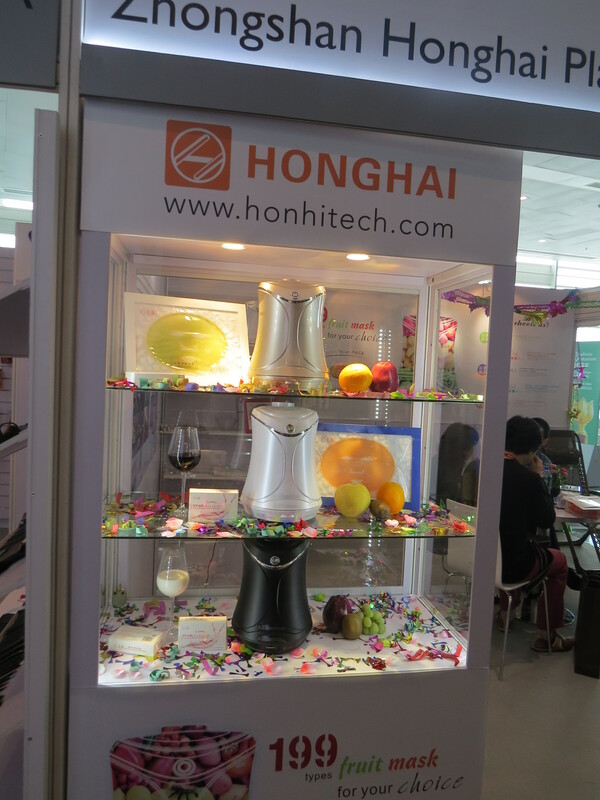 A manufacturer that I really liked was Zhongshan Plastic Technology from China. I was just passing by their stand on the way to somewhere else but was so intrigued by the product demonstration that I stopped for a closer look. 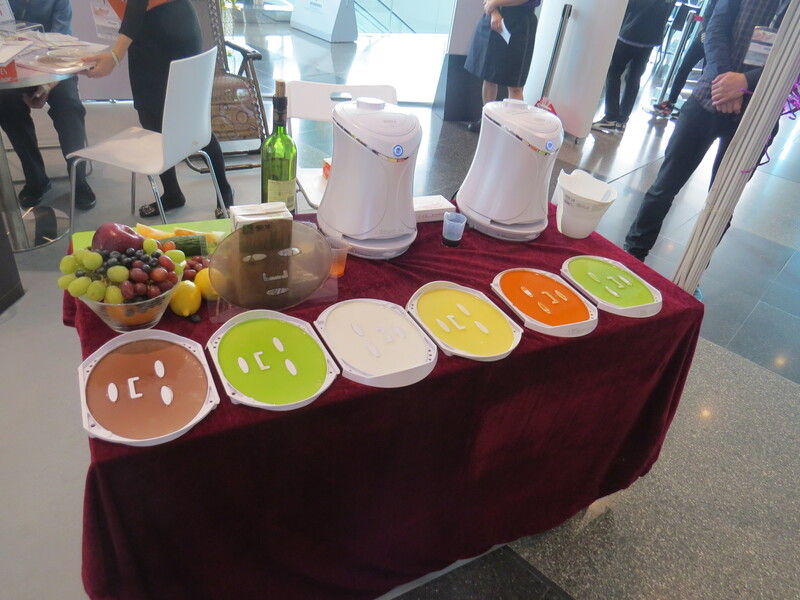 The company has developed a Fruit Mask Machine which allows you to manufacture your own gel sheet face masks. The concept is really ingenious and fascinating to observe (they showed the whole process at the exhibition stand). A gel capsule is inserted into the machine (which is quite small and compact). Then you add mashed fruits or vegetables, juice, wine or milk to the mixture and then the whole lot is poured into a face mask mould. Wait for 6 minutes until the thing hardens and presto! A home-made gel mask with all-natural ingredients. You can’t get more customized than that! The machine costs 229 USD (retail price) and is available in white, black and gold. Very stylish. I also liked Emilia, a company from Israel. Emilia has several brands, including Oil Essentials, a range of six sumptuous multi-purpose oils which can be used for face, body or hair care. And their Aureli line is an anti-ageing sun-protection range which comprises four skin care and three body care products. I was impressed by the texture of the face care gels which have a silky, light and very pleasant feel and come with SPF 15, SPF 30 or SPF 45 respectively. One of the products is called Satin Skin Perfecting Balm; it’s a tinted sun protection balm with SPF 30 which blended into the skin impressively well. 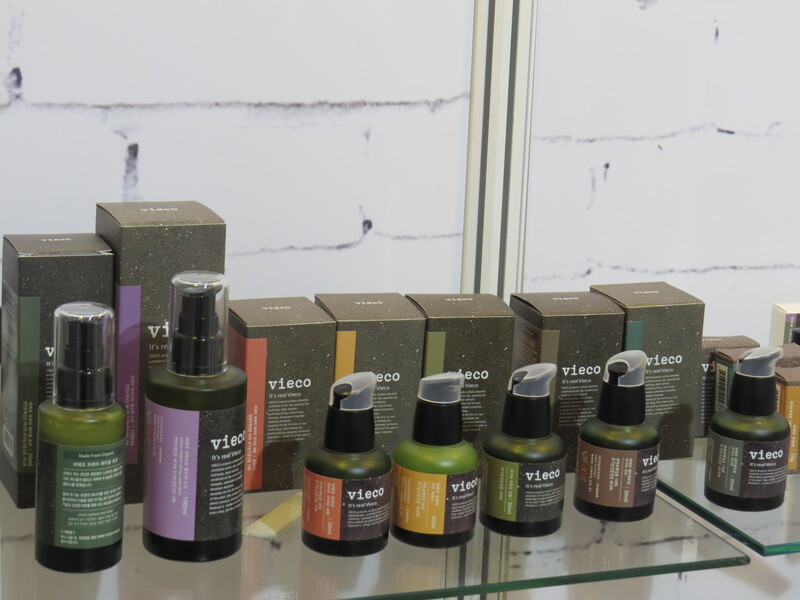 Akane from France is a new organic brand (products are certified by CosmeBio and Ecocert). The company was founded in 2012 and in France its products are sold in outlets of Monoprix and Parashop. Akane’s products are formulated with apple and apple leaf extracts and rosehip oils and the range includes a cleansing milk and a cleansing oil, a regenerating serum, moisturizing cream and anti-wrinkle cream, a night mask. There is also Rosy Dew Cream which is tinted pink and gives skin a very light glow, a lip and cheek balm, a BB cream and a BB eye contour balm The founder of Akane, Aline Foulet, told me that her bestsellers in France include the cleansing oil and the night mask, and these were also the two products that I found the most interesting. What I also liked about the Akane products is that the packaging sizes are smaller than the usual pack sizes so they are nice and portable. 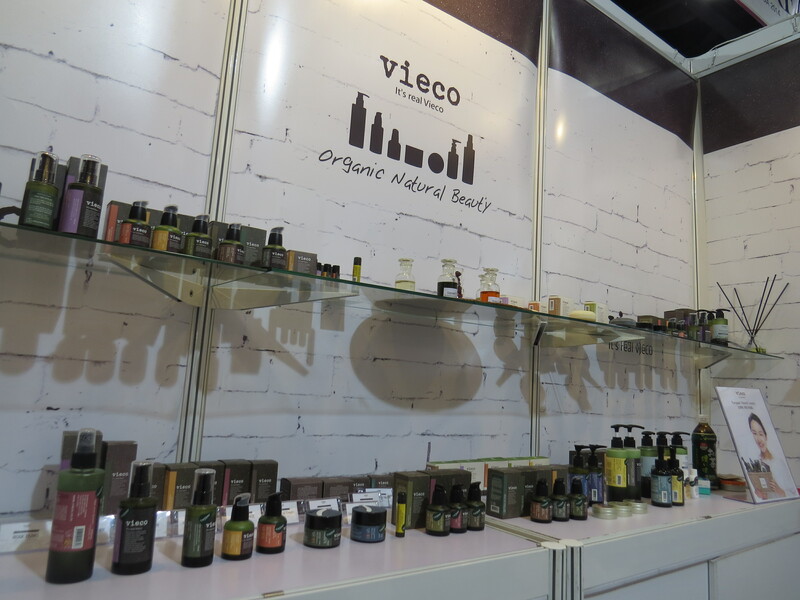 Another interesting organic brand is Vieco from Korea. 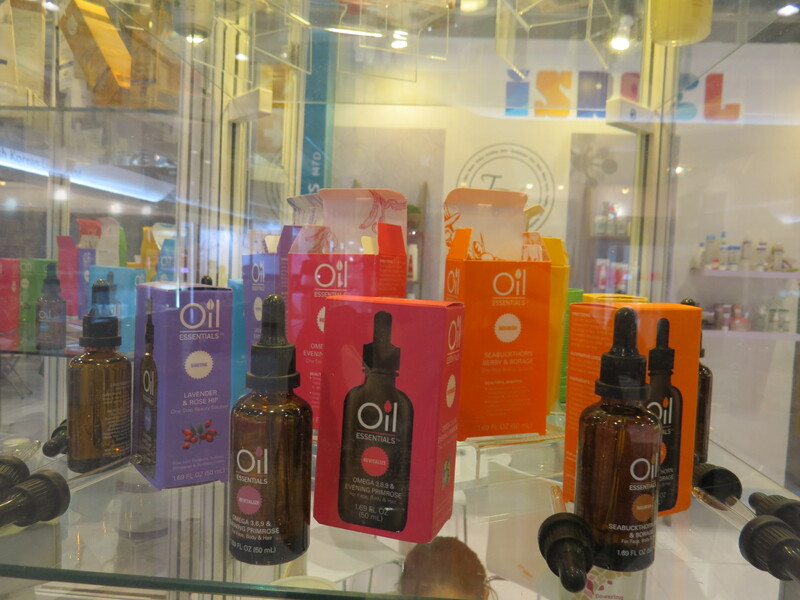 They have a beautifully packaged range of skin and body care (check out the pics!) which includes a rose facial water, a hydrating toner, a moisturising lotion, an oil essence, a serum and a face cream. The line-up also includes three facial oils (jojoba, argan and rosehip), a cleansing oil and three oils to balance, brighten or hydrate the skin. One the body care side, there are three aroma massage oils, three baby products, four bar soaps, four intensive balms and a lipbalm. Nice packaging and great ingredients. Also from the organics sector is Canvas from Australia. This is a premium-priced organic range with beautiful packaging and a well-structured brand portfolio. Canvas was established in 2004 in Melbourne and products are certified by the Australian ACO. The line-up comprises aromatherapy products (including 36 essential oils, carrier oils and body oils), a body care range divided into three sub-ranges (Rose Otto, Frankincense and Ylang Ylang – each line includes a body wash, body lotion, hand cream and exfoliating body wash) and four different skin care ranges (Botanical D-Tox for problem skin, the brightening Perfect White Renew, anti-ageing Buddhawood & Rose and the moisturizing Fragonia & Lavender). The four ranges are packaged in, respectively, blue, purple, pink and green with gorgeous cardboard outer packaging. 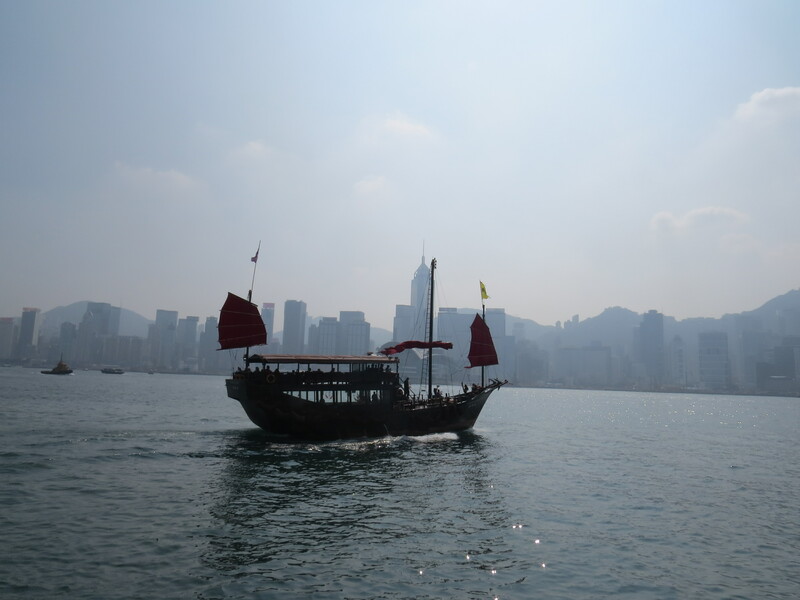 In Hong Kong Canvas is retailed in very up-market department stores, including Times Square Mall in Causeway Bay, Harvey Nichols in Admiralty and Hollywood Plaza in Kowloon. 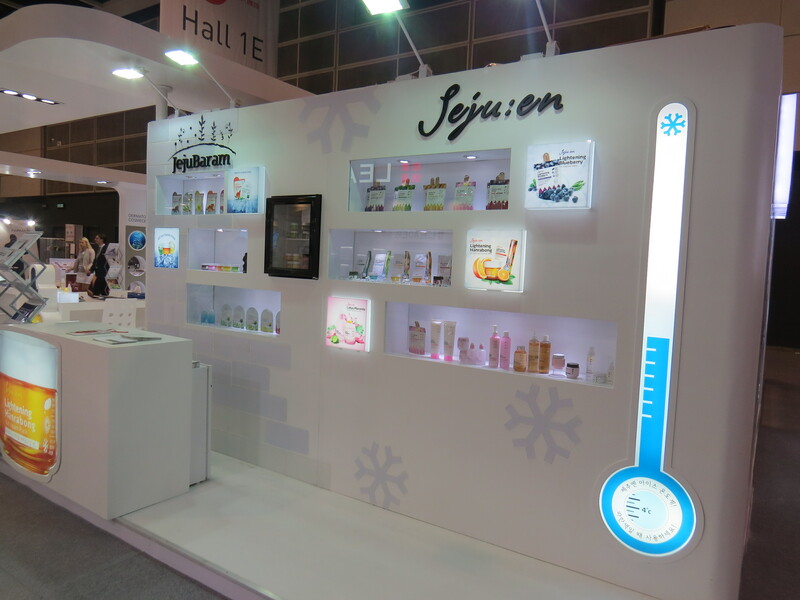 At the show I noticed that many Korean companies featured products and brands that were either manufactured in Jeju (a volcanic island in South Korea) or formulated with Jeju ingredients. 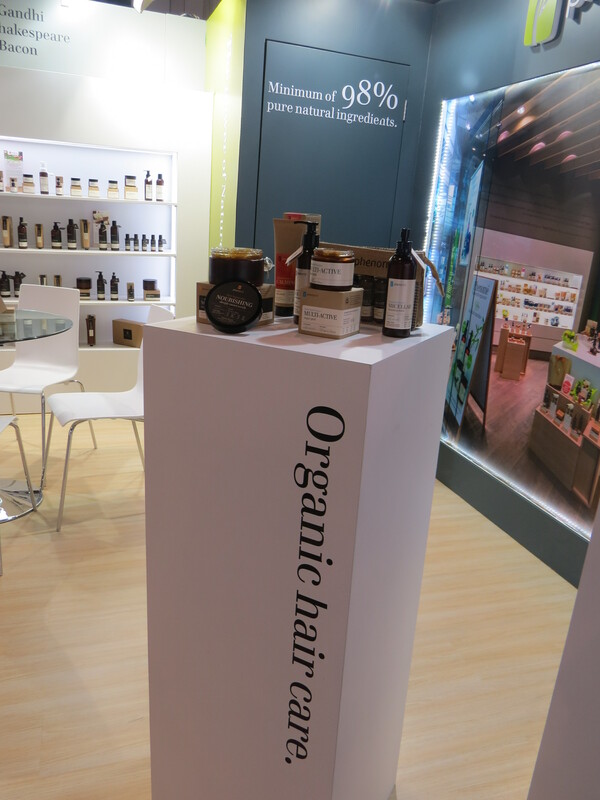 I checked out a few of the Jeju brands and particularly liked a small stand which presented the products of Herbolle, an organic product range produced in Jeju. The company behind Herbolle, Urban Farmers, runs an organic herb farm in Jeju where they grow lavender, rosemary, lemongrass, tea tree and so on – Jeju has a sub-tropical climate and apparently European plants grow well there. The Herbolle products are formulated with ingredients harvested at the farm, the packaging is simple and elegant and the brand as a whole was very appealing. A non-organic brand which I found quite charming was a;t fox from Korea, which was one of the exhibitors at Spot on Beauty. As the name suggest (for a;t read “afternoon tea”) the products are based on three different types of teas. The purple range (Bewitching & Radiant Fox) is formulated with Jasoyup tea (which, I think, is the Korean term for perilla) and products include a moisturizing cream, a makeup fixing spray, a BB cream, a solid cleansing bar shaped like a bar of chocolate and a hand cream. Elegant & Enchanting Fox (the pink range) contains Black tea extract and the products include a primer, a BB cream, a lifting cream and a hand cream. Dewy & Babyface Fox (orange packaging) is based on Gyoolpy tea (tangerine peel) and features a White chocolate soap bar, a facial water, a BB cream, a water gel cream, a compact powder and a hand cream. The three face creams are packaged in plastic cupcakes. Very kawaii! So far, so cute. However, what I really liked about this brand is that its products are sold in an actual tearoom. The company operates a tea café in Seoul where they sell tea, coffees, cakes and desserts – and after having enjoyed a cup of, say, Jasoyup tea you can then treat yourself to a face cream formulated with that exact same tea fragrance. Some of the desserts and cakes also feature the three signature tea scents and colours. I just love innovative brand concepts! And a Japanese brand which looked very intriguing was Natural Organics Black Paint (Myyuki) which comes from Kyoto. Now, this exhibitor didn’t allow any photography at its stand so there are no pictures, check out the manufacturer’s website for images of the Myyuki soaps or click on this site: http://blackpaint.sg Incidentally, many of the exhibitors at the show, especially the European and non-Chinese Asian brands had big signs forbidding filming and photography. Intellectual copyright theft and product piracy is a very real and massive problem in Asia (at least for non-Chinese companies…!). 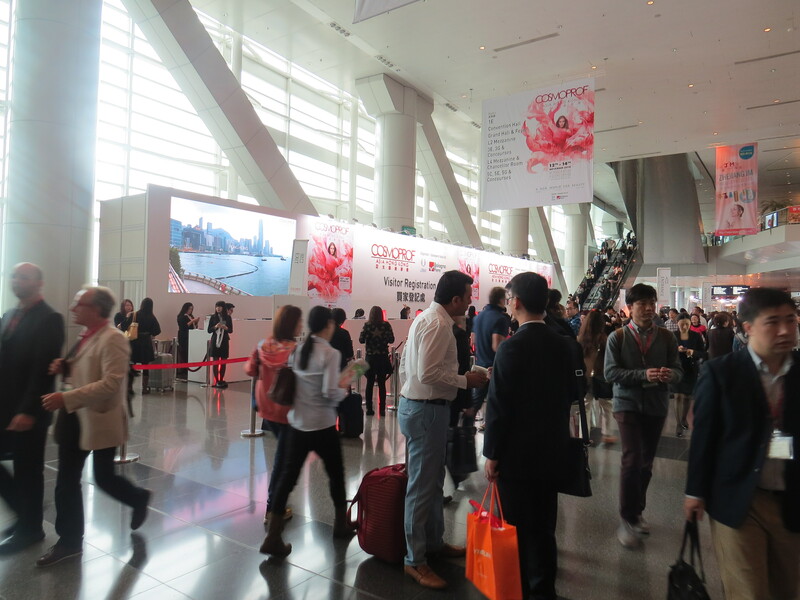 And visitors from mainland China were one of the biggest visitor groups at Cosmoprof Asia – there was even a special entry area and registration desk for mainland visitors and groups. I was told by various exhibitors that there were spies everywhere at the show. And I think I even spotted a few of them – mostly they didn’t look like trade show visitors at all and were continually and very steadily taking pictures with pocket-sized cameras. Anyway, to return to Myyuki. The company makes a special kind of face cleansing soap – one variety is black and one is white. Once the flower-shaped soap bar is immersed in water it becomes slightly spongy. It can then be rubbed onto the skin to cleanse it. The facial soaps contain ingredients which are mostly from certified organic agriculture. The black soap (Black Paint) also contains charcoal powder, the white variant (White Paint) pearl powder and titanium dioxide. The packaging of the soaps is gorgeous, with thick texturised paper – it looks like hand-made rice paper. In Japan Myyuki is sold in various up-market department stores chains (including Takashimaya, Mitsukoshi, Hankyu, Daimaru and Odakyu) and I have already decided to check them out on my next trip to Tokyo – which, for those who are interested, will be in February/March 2015! 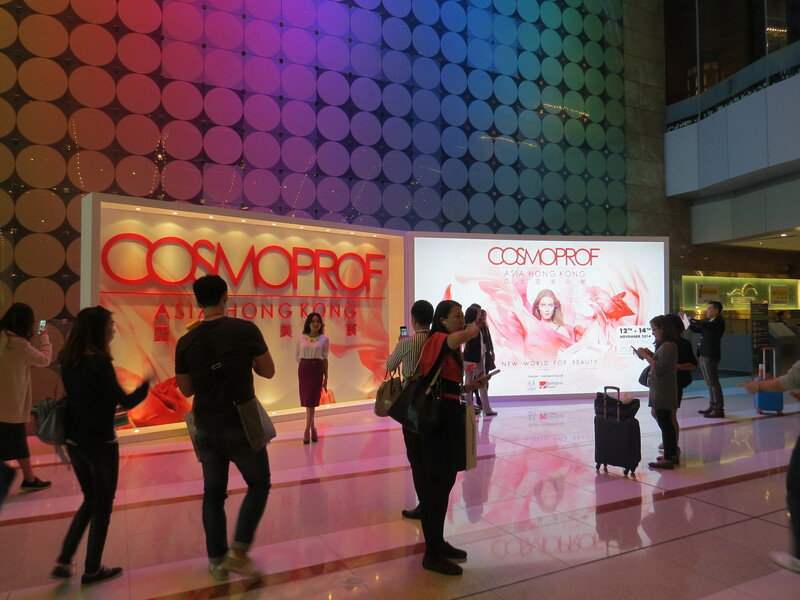 Cosmoprof Asia also included a series of workshops, lectures and seminars on different topics – they had some really interesting speakers and I would have liked to attend some of the lectures. But since I had a limited time frame, I decided to concentrate on the exhibitors and spent most of the three Cosmoprof days walking around the halls. However, I made sure to attend one lecture at least: a seminar on the organic beauty market in Japan. It was a very interesting two hours; the speakers included Atsushi Ebuchi, editor of Diet & Beauty Magazine and Mitsuru Ogi, VP and creative director at Mash Beauty Lab – the company behind Cosmekitchen. In Tokyo I had visited several Cosmekitchen and Biople stores and really liked the retail concept behind the two chains (check out my article on Cosmekitchen/Biople here). The speakers presented some very interesting information on the Japanese organic C&T market, with a lot of figures and data (and I do love cosmetics data!). It was also good to know that my assumptions about the organic beauty market in Japan – which were, after all, based on observations and deduction alone – were absolutely correct. The Japanese organic C&T market is growing strongly; although it is still only a very small percentage of the whole cosmetics sector the growth rates are undeniable. And yes, Cosmekitchen IS the market leader in the organic beauty market.